Xanaland Neutral Cat News! : The Ghost of Buddy Rich Lives in This Amazing " Mystery Grandma Drummer"
The Ghost of Buddy Rich Lives in This Amazing " Mystery Grandma Drummer"
This is just awsome! 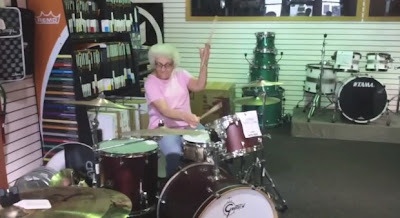 I only wish the ' Mystery Drummer ' would come forward, what a character to sit down in a random drum shop and blow everyone away and then disappear without telling anyone here name or where the hell she learned to drum like that! Here is the video they thankfully got, the drum shop is The Coalition Drum Shop in La Crosse, Wisconsin.